With 7 Wash Cycles and 15 available options, the FRIGIDAIRE FAFW3574KA from the Affinity series can provide most customized combinations for product operation. The high programmability helps the consumer get the most out of the product. This front-load washing machine also comes with a heavy duty door that seals in the freshness of the load. A multitude of washing options provide a laundry experience that is customized to the user’s particular needs. An example is the Fresh Water option, which enables the load to get rid of as much detergent and additives as possible during the cycle to prevent possible allergens from reaching sensitive skin. The consumer, through the use of the FRIGIDAIRE FAFW3574KA, can reduce the wash time by using some special features. The consumer may also reduce the energy used through the Power Saver option, which reduces energy use by 60%. Several options. It is designed to ensure that each of those options can deliver superb cleaning through the WashSense Technology feature. The strength of operation will depend on the amount of soiling in the load. Start the Washer from one Hour to 14 hours later, with the washing machine’s DelayStart feature. To reduce noise and vibration, it comes with a Vibration Control System that enables it to wash even heavy loads with a smooth, balanced and quiet operation. 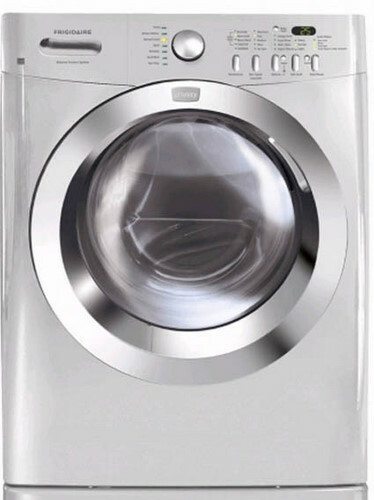 The Add a Garment feature allows the washing machine’s operation to be put on hold so that garments can be added to the load. Heavy duty Stay Put door that seals the freshness in. This particular Frigidaire model makes use of the Fresh Door Seal feature. The touch button controls are user-friendly. The Express Select options enable the consumer to just press a button to select a particular option. The last cycle setting will also be automatically saved. This particular washing machine is also available in other classic colors, such as blue, red, white and black. With so many options available, the consumer is bound to find the perfect combination for his or her load. As there are time saver and power saver options, the consumer can choose to save time, power, or both. The consumer can also choose from among color options. Alternative colors provide the consumer with flexibility in design and style. This washing machine operates with minimal if not no vibration and noise. It also makes use of the minimum energy required while still providing intense cleaning appropriate for the degree of soiling of the load. The model does not offer steam cleaning, which may be necessary on some garments.